Silly blue screen that scrolls a message which I am sure can be shut off somehow. Wow I bought this for a friend that wanted a budget mini system. My high Pioneer Elite VSX-29TX Receiver was in the shop so I borrowed this to watch a DVD on a JVC 32D TV. I plugged in my NHT Subwoofer to the unit. I was totally amazed. I hate to say it but this unit sounds almost as good as my Elite system with Martin Logan SL3 speakers. 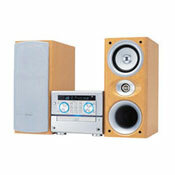 If you want a mini system for a small apartment don''t walk but run and get one of these. I strongly suggest you treat yourself to a good self powered subwoofer to really round this out.